Fidelio was Arturo Toscanini's first complete opera performance to be broadcast in the USA, over the NBC radio network, in December 1944, by the NBC Symphony Orchestra, featuring soloists from the Metropolitan Opera (though a shortwave broadcast of one act, conducted by Toscanini, had earlier been relayed from a 16 August 1936 performance at Salzburg.) Divided into two consecutive broadcasts, the 1944 performances were later issued by RCA Victor on LPs and CDs. Cairns, David (2001). 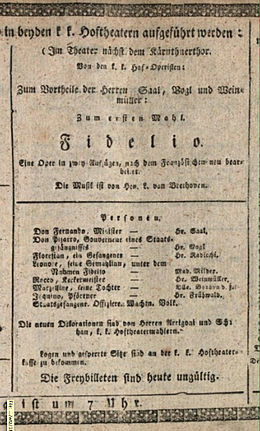 "Fidelio, oder Die eheliche Liebe (Fidelio, or Married Love)". In Holden, Amanda. The New Penguin Opera Guide. New York: Penguin Putnam. ISBN 0-14-029312-4. This page was last edited on 8 April 2019, at 07:26 (UTC).